Although there doesn’t seem to be any such thing as a “First Confession Party”, it’s still a major milestone in your child’s life. Receiving a Sacrament is a big deal! So, how can you celebrate? Here are some ideas. Depending on the time of day, you might rather take the family out to eat or have a special family dinner at home. You could even invite the priest to come! Check this idea- Give your child an eraser! I’ve seen these erasers “for big mistakes” at the Dollar Tree. This is a great way to recognize the sacrament in a symbolic way without filling your house with more dust collecting trinkets, or breaking the bank. 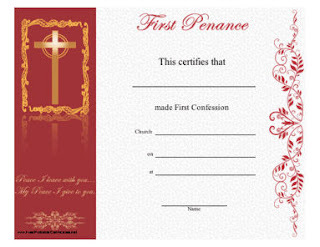 This might be a cute gift idea to send to your God child for their first reconciliation. Let them know you haven’t forgotten their important religious day! Give your child a nice wooden crucifix with the dates of their Sacraments written on the back. In this case, that would mean writing in their Baptism date and First Reconciliation date. Be sure to leave room for future Sacraments! This way, the dates of their big days will always be easily accessible. Think to yourself, “is there anything I still want my child to have before they make their First Communion?” If there is, by all means it may as well be now! Here are some ideas along those lines of thought. It’s such a cute tradition to make a First Communion Banner before the big day. 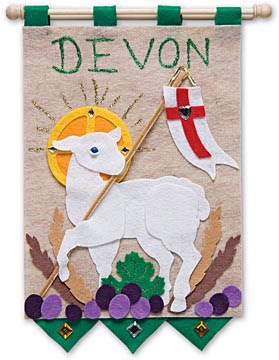 Check out these First Communion Banner kits from Illuminated Ink– a great gift idea! Have you seen the new Catholic Children’s Bible from Saint Mary’s Press? It’s a full Bible, but actually for kids. It’s the first of its kind available for Catholic children. This is what I got Lydia for First Confession. It arrived last week and I am very excited about it! Seems like a great resource for Catholic kids. The Weight of a Mass– A charming picture book for Catholic children! In the book, a beggar woman asks for a scrap of bread, and promises the baker to offer a Mass for him in exchange. He scribbles “Mass” on a tiny piece of paper, puts it on a scale, and says she can have whatever the Mass is worth. Throughout the book, no matter what he puts on the other side of the scale (cookies, stacks of pastries- even a wedding cake), the Mass weighs more! It’s a miracle! Very cute story. We love the Glory Stories CD’s from Holy Heroes, and they have one for First Communion! Check out this story of Blessed Imelda, the patron Saint of First Communicants. We’re also a big fan of the Brother Francis movies, and they have one about Confession, and one about the Eucharist. I highly recommend the Brother Francis movies. Very high quality, solid, and well done without being overly corny. My kids love them! Don’t forget about A Picture Book of the Mass! This is a missal for Catholic kids with beautiful Catholic art throughout. It will help your kids follow along and pay attention, and these do make great gifts. How does your family celebrate first reconciliation? .Check out all of my First Communion Resources for Kids here. Those are se great ideas! I had ice cream after my first reconciliation. My mother always made sure our first reconciliation was a special day. She always recommends her friends and her students' parents to make that day special for the kids. I plan to keep up with the tradition but will spice it up with a few of the ideas on this post. Love the big eraser idea!!! My daughter is making hers tomorrow. I know the church is having a little reception afterward for the families. She also gets to choose her favorite dinner and I bought her a cross from the Catholic bookstore. We make sure that we get to take our child alone to their First Reconciliation (which is a big deal in a family with 6 kids) then we go to reconciliation too after them. Then we take them out for a breakfast at someplace they chose. Which is huge since we never go out to restaurants for breakfast. Then we spend the time just being together and talking about their experience and how they felt about it. It is something they all look forward to and those that are done, remember! Our school/church makes it an event in the evening and all the families go. We got her a new dress to wear, it was really nice. Then we did go out for dinner. I just found this blog and I just love it!! Perfect timing. My daughter is making her first reconciliation tomorrow. I love the certificate as our church says they won't have them due to the confidentiality of the sacrament. I also love the ice cream idea and think it should be a tradition. I did order her a pin and charm from The Catholic Company. I love your blog! Keep up the great work! At the Catholic school where I work the parents sneak into the classroom while the children are at confession. The room is decorated with white helium balloons to signify their pure souls. Light refreshments are served and they get to wear fancy free dress clothes to school that day. A very big deal at our small school. The entire school goes to mass on that day and the students receiving the sacrament are recognized and prayed for by their schoolmates. It is a very special day. We give our kids the book "Today I Made My First Reconciliation" book by Dianne Ahern. It is a combination story book (about two second graders who learn the true meaning of reconciliation) and memory book, because there are spaces to record the date, memories of the event, paste photos, etc. I think most Catholic bookstores would carry it; Amazon does too. There is a companion book for First Eucharist called "Today I Made My First Communion." Makes a nice set to remember those two special days! My daughter made her First Reconciliation in December. We also gave her a "Reconciliation Story Bracelet." It has different symbolic charms and colored beads along with a card that explains the meaning of each. My daughter's first reconciliation was in the morning, so we went out for lunch at her favorite restaurant. For First Reconciliation, we have given the kids a small something that they've been wanting – a book, a game, whatever. Nothing huge, but maybe in the $20 range. I've seen your site recommended on our Catholic mother's group and recognized it while I was searching something for First Communion. OK, I know this is Confession but I was several pages from my first search. 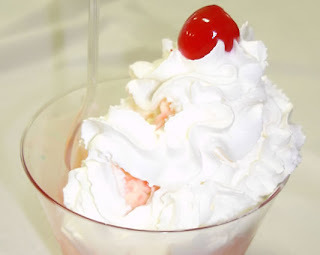 I love your idea about the ice cream and I agree that it should be a Catholic tradition! My youngest is about to take his quiz with the pastor for his First Confession/Communion so I'd like to ask all of you to pray for him till his test on February 11. I'm the one who's nervous. He doesn't like ice cream but we can sure do something else special – he likes white chocolate! That'll work. Thanks for the great ideas – I'm bookmarking your site! HAHAHA…..I JUST found out about these banners! The Man was "yeah-they're really common." 😉 Thanks to your post I found out we may be able to hang ours at our church. My children don't go to CCD as we have their Religious education built in at home-they will get their first communion at a regular mass, so I thought-What do i actually DO with the banners?! And you have such fun ideas for the other things…thanks! You've made this new adventure for me, as a mom, very exciting and much more fun. For my son (three years ago) we went out for lunch and special dessert – and he received two small gifts (I can’t even recall them off-hand! I remember his FHC gifts….) – one from the priest and one from me. I should note that the priest is a friend who lives 12-hour drive away; we received special permission for him to hear my son’s first confession in our local parish (we are not members at the local parish; but my son attended the CGS atrium there that year – and still does). What I wanted to comment though is that within the Catechesis of the Good Shepherd retreat day, they did First Reconciliation (second for some of the children, including my son) – then followed it up by a renewal of their baptism promises, donning a white garment (reminiscent of baptism) and receiving a candle with a printed label on it commemorating the day. It was a beautiful prayer service led by the priest, then they processed back to the school building for a Last Supper celebration. That little ceremony is SO beautiful! For my daughters, right after their first confession is when they could choose to get their ears pierced – Beauty from Pain just like beautiful fruits from the challenge of looking at themselves honestly. We are a very rural parish, so we have a combined retreat with a few other churches on a Saturday morning with each parent and child, then we hand out certificates at each parish the Sunday service during announcements to publically recognize the kids maturing in their faith practice. My son is getting ready for his first reconciliation this weekend, so I really appreciated these ideas. I think he’ll like the vanilla ice cream tradition the best though!! My parish has students light their Baptism candle from the Easter candle as the exit the confessional. We pray and sing and then have a pizza party for them! (There is such a thing as a First Rec Party!) We want the kids to know this Sacrament is worthy of celebration! I am just looking for some games to add to the festivities.